I just happened to see some of your "Isai Payanam" videos on Youtube. Amazing. I must congratulate you on educating the masses and popularising the rich tradition of Karnatik music. I learnt quite a lot. 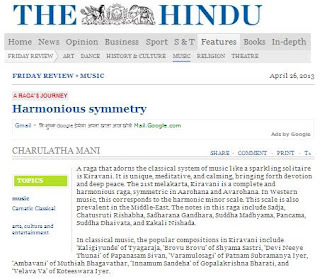 & In PK Sambandham, Kamal's sagala kala vallaveny and the next raga 22 is a symmetrical tetrachord as opposed to Harmonious Symmetry of raga 21!